Earnings before interest, tax, depreciation and amortization (EBITDA) is a measure of a company's operating performance. Essentially, it's a way to evaluate a company's performance without having to factor in financing decisions, accounting decisions or tax environments. EBITDA is calculated by adding back the non-cash expenses of depreciation and amortization to a firm's operating income. 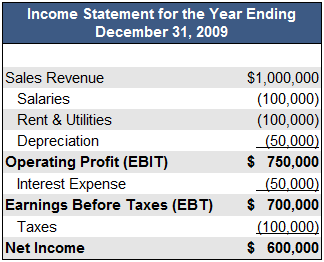 EBITDA is calculated using the company’s income statement. It is not included as a line item, but can be easily derived by using the other line items that must be reported on an income statement. EBITDA is one of the operating measures most used by analysts. EBIDTA allows analysts to focus on the outcome of operating decisions while excluding the impacts of non-operating decisions like interest expenses (a financing decision), tax rates (a governmental decision), or large non-cash items like depreciation and amortization (an accounting decision). However, EBITDA can also be deceptive when applied incorrectly. It is especially unsuitable for firms saddled with high debt loads or those who must frequently upgrade costly equipment. Furthermore, EBITDA can be trumpeted by companies with low net income in an effort to "window-dress" their profitability. EBITDA will almost always be higher than reported net income. Also, because EBITDA isn't regulated by GAAP, investors are at the discretion of the company to decide what is, and is not, included in the calculation. There's also the possibility that a company may choose to include different items in their calculation from one reporting period to the next. Therefore, when analyzing a firm's EBITDA, it is best to do so in conjunction with other factors such as capital expenditures, changes in working capital requirements, debt payments, and, of course, net income. What made you want to look up EBITDA? Please tell us where you read or heard it (including the quote, if possible).